Calitzdorp cellar De Krans has shown some admirable innovation in recent times. 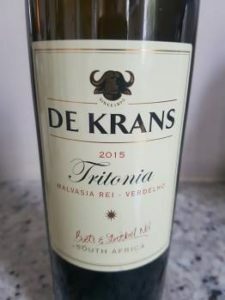 The flagship Tritonia Red 2014, a blend of 67% Touriga Nacional, 22% Tinta Roriz, 6% Tinta Barocca and 5% Tinta Amarella (R160 a bottle) rated 87 on the 100-point quality scale in the Laurium Capital Signature Red Blend Report earlier this year and it is now joined by the maiden release 2015 Tritonia White, produced from 85% Malvasia Rei (also known as Palomino Fino) and 15% Verdelho grapes. The Malvasia Rei berries were crushed into a lagar and left on the skins to start fermentation naturally before being transferred to tank for four months. The Verdelho, meanwhile, was barrel- fermented and left on the lees also for four months. The wine was then blended and barrel matured for 15 months. On the nose, the wine shows orange plus a Sherry-like quality, which is to say a slight nuttiness plus some spice. The palate is light yet flavourful with bright acidity. It’s an unusual yet very appealing drop – not super-refined but so much more interesting than your average Sauvignon Blanc. Price: R140 a bottle.